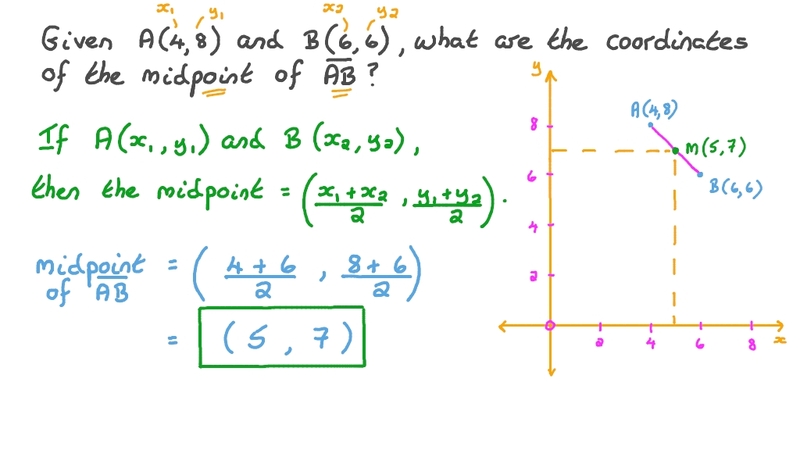 In this lesson, we will learn how to find the coordinates of the midpoint between two points or those of an endpoint on the coordinate plane. Given 𝐴 ( 4 , 8 ) and 𝐵 ( 6 , 6 ) , what are the coordinates of the midpoint of 𝐴 𝐵 ? Given 𝐴 ( 2 , 1 ) and 𝐶 ( − 8 , − 9 ) , what are the coordinates of 𝐵 , if 𝐶 is the midpoint of 𝐴 𝐵 ? Consider the points 𝐴 ( 𝑥 , 7 ) , 𝐵 ( − 4 , 𝑦 ) , and 𝐶 ( 2 , 5 ) . Given that 𝐶 is the midpoint of 𝐴 𝐵 , find the values of 𝑥 and 𝑦 . The origin is the midpoint of the straight segment 𝐴 𝐵 . Find the coordinates of point 𝐵 if the coordinates of point 𝐴 are ( − 6 , 4 ) . Consider the points 𝐴 ( 7 , 7 ) , 𝐵 ( 9 , − 7 ) , and 𝐶 ( 5 , 1 ) . Given that 𝐴 𝐷 is a median of the triangle 𝐴 𝐵 𝐶 and 𝑀 is the midpoint of this median, determine the coordinates of 𝐷 and 𝑀 .
𝐴 , 𝐵 , 𝐶 , and 𝐷 are collinear points. Suppose that the coordinates of points 𝐴 and 𝐶 are ( 2 , 4 ) and ( − 8 , − 8 ) , respectively, and that 𝐴 𝐵 = 𝐵 𝐶 = 𝐶 𝐷 . What are the coordinates of 𝐵 and 𝐷 ? If 𝐶 ( − 5 , 4 ) is the midpoint of  𝐴 𝐵 , where 𝐴 ( 𝑥 , 4 ) , 𝐵 ( − 5 , 𝑦 ) , find the values of 𝑥 and 𝑦 .
𝐶 is the midpoint of 𝐴 𝐵 . Find the values of 𝑥 and 𝑦 if the coordinates of 𝐴 , 𝐵 , and 𝐶 are ( 𝑥 , 4 ) , ( 3 , − 2 ) , and ( 9 , 𝑦 ) respectively. The coordinates of the points 𝐴 , 𝐵 , and 𝐶 in the parallelogram 𝐴 𝐵 𝐶 𝐷 are ( − 2 , − 5 ) , ( − 5 , − 7 ) , and ( − 1 , − 1 3 ) , respectively. If the point 𝐸 lies on  𝐴 𝐷 such that 𝐴 𝐸 = 2 𝐴 𝐷 , determine the coordinates of the points 𝐷 and 𝐸 . The point 𝐶 is on ray  𝐴 𝐵 but not segment 𝐴 𝐵 , and its distance from 𝐴 ( 3 , 0 ) is 2 times its distance from 𝐵 ( − 9 , − 6 ) . What are its coordinates? Find the values of 𝑎 and 𝑏 so that ( − 2 𝑎 , 2 𝑎 + 𝑏 ) is the midpoint of the line segment between ( − 2 , − 3 ) and ( 2 , 1 1 ) . 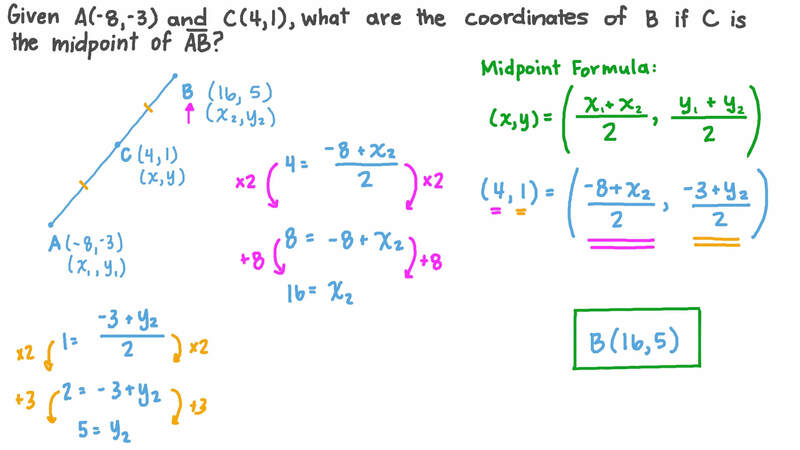 Find the point 𝐴 on the 𝑥 -axis and the point 𝐵 on the 𝑦 -axis such that  3 2 , − 5 2  is the midpoint of 𝐴 𝐵 . Point ( 2 , − 7 ) is the midpoint of the line segment on endpoints ( 𝑥 , − 9 ) and ( 1 , 𝑦 ) . What is 𝑥 + 𝑦 ? 𝐴 ( 3 , 1 7 ) , 𝐹 ( 1 0 , 1 7 ) , 𝐵 ( 1 7 , 1 7 ) , 𝐷 ( 4 , 8 . 5 ) , and 𝐶 ( 1 8 . 5 , 4 . 2 5 ) are points on the trapezoid 𝐴 𝐵 𝐶 𝐷 . If 𝐹 𝐺 is parallel to 𝐴 𝐷 , what is the 𝑥 -coordinate of point 𝐺 ? Suppose the circle of centre 𝑀  − 4 , 1 2  and diameter 𝐴 𝐵 , where 𝐵 ( − 3 , 0 ) . Find the coordinates of 𝐴 , and give the circumference to two decimal places. A rectangular garden is next to a house along a road. In the garden is an orange tree 7 m from the house and 3 m from the road. There is also an apple tree, 5 m from the house and 9 m from the road. A fountain is placed halfway between the trees. How far is the fountain from the house and the road? 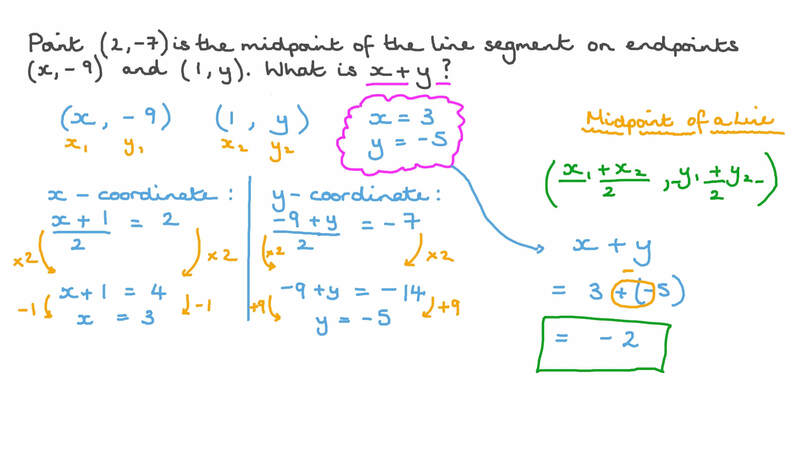 Find an expression for the midpoint of the line segment 𝐴 𝐵 .
𝐴 and 𝐵 have the coordinates ( 1 , 1 ) and ( 3 , − 5 ) respectively. Find the midpoint of the line segment 𝐴 𝐵 . On the graph, which point is halfway between ( 1 , 8 ) and ( 5 , 2 ) ? Points 𝐴 and 𝐵 have coordinates ( 3 , 3 ) and ( − 2 , − 5 ) respectively. Is the point  1 2 , − 1  the midpoint of segment 𝐴 𝐵 ? Let 𝐴 ( − 3 , − 8 ) , 𝐵 ( − 3 , 6 ) , and 𝐶 ( 3 , − 8 ) be the vertices of a triangle. Suppose that point 𝐷 on 𝐵 𝐶 is such that  𝐴 𝐷 bisects the angle at 𝐴 . What is the point 𝐷 ? Two points 𝐴 and 𝐵 are at ( 1 , 3 ) and ( − 2 , − 5 ) respectively. Point 𝐶 lies on the line segment 𝐴 𝐵 such that the lengths of 𝐴 𝐶 and 𝐶 𝐵 are equal. Find the coordinates of 𝐶 . If the coordinates of the points 𝐴 and 𝐵 are ( 2 , 9 ) and ( − 8 , 1 ) respectively, find the midpoint of 𝐴 𝐵 . Which number is at the midpoint of 𝐴 𝐵 ? If 𝐶 is the midpoint of 𝐴 𝐵 , find the values of 𝑥 and 𝑦 if the coordinates of 𝐴 , 𝐵 , and 𝐶 are ( 9 , − 7 ) , ( 5 , − 5 ) , and ( 𝑥 , 𝑦 ) respectively. Suppose that 𝐴 ( 6 , 1 0 ) and 𝐵 ( 6 , 1 5 ) . What is the midpoint of 𝐴 𝐵 ?